Although you might not be required to perform each of these techniques every day, it is essential that you keep them in good shape so that they are ready to go when you do need them. I’ve found that even just five minutes or so of dedicated practice in each area helps to maintain proficiency. If your regular daily routine doesn’t already include patterns for developing the following skills, you can choose from among the many excellent resources already out there, or create your own. One perplexing decision faced by high-school students on the verge of entering collegiate music programs is whether to teach or perform. Period. Black and white. Will you spend the rest of your life in an elementary-school music classroom playing Orff instruments and chanting the “ta’s” and “ti-ti’s” of Kodály rhythms, or will you spend your time playing standard concerti and meticulously preparing for orchestral auditions? Read more: To Teach or Not to Teach? The first step in making the most of preparation time is to develop a plan. It is essential for the aspiring musician to maximize effective problem-solving techniques in order to utilize available practice time wisely. Planning ahead means prioritizing the preparation of materials while keeping a watchful eye on overall progress. With students, it is good to set goals of varying length. Short-term goals consist of the successful completion of weekly lesson materials and nagging problems/figures in ensemble or solo music. Medium term goals would be identifying needs for later in the semester. This could be the preparation specific material for concert ensembles or looking ahead at specific literature requirements within the applied studio. Finally, there should be long-range goals. These can address specific performance preparation such as a jury, recital, or competition. Also, this can address a special need such as range development, improvement of technical facility, or ensemble placement. It is important that goals be realistic, especially on the short and medium categories. Once expectations are met and success is achieved, this positive reinforcement gives the impetus for further, and more adventuresome, goals. The Berlin Philharmonic Orchestra is one of the few classical music ensembles around which can expect to fill a concert hall every time it takes to the stage, and almost regardless of what is on the programme. The orchestra is revered by the public and admired by the critics. What’s it like to be a member of the Berliner Philharmoniker’s horn section? To find out, Jonathan Stoneman visited the section during rehearsals for Strauss’s Salome in Salzburg. It might be reasonable to expect that playing in an orchestra as consistently good as the Berlin Philharmonic would breed in its players either arrogance and complacency, or enough relentless pressure that only superhuman players would survive. 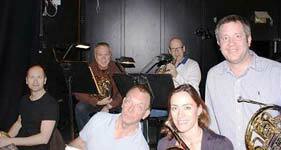 When seen in close up, on and off duty, the Berlin Philharmoniker horn section isn’t in either category. Why not? The answer is both simpler, and more complicated than you might expect. Read more: A hero’s life? I sat with John Clark in a coffee shop on New York City's Upper West Side on a rainy day in February. We chatted about playing horn in the city, getting into jazz on the horn, and about his book Exercises for Jazz French Horn. I’m accepted!!!!! So what should I do now?